On December 3rd of this year, chief executives from some of the world’s leading companies, including Dow Jones, AT&T, Pfizer and others, are gathering in Carlsbad, California to address topics like organizational cultural change, diversity and inclusion and society’s digital future. 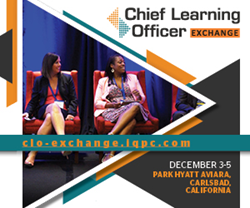 The Chief Learning Officer Exchange, taking place at the Park Hyatt Aviara from December 3-5, is an annual event where learning executives from Fortune 1000 companies gather to discuss complex industry topics, learn from thought leaders and find solutions to pressing issues. On the opening day of the Exchange, AT&T University Operations Training VP Eliska Paratore will speak on the role of learning and development in preparing for a digital future, including the incorporation of simpler, more accessible training platforms and fostering a culture of continuous learning to fuel future growth. Dow Jones VP of Talent Management Meredith Lubitz will join Sandra Baglione, Senior Director of Learning and Development for the Royal Bank of Canada later in the day to host a panel discussion on responding to evolving employee expectations in the workplace, continuing to build gender equality and adopting the right tools to reimagine learning for a new era. On day two of the event, Pam Puryear, Chief Talent Officer along with Julie Staudenmier, Vice President, Talent Management and Development of Pfizer, will share a candid conversation detailing how Pfizer’s talent and executive leadership teams implemented a new leadership framework that reinforced and sustained their highly accountable culture. They will explore how to “live the message” of leadership and leverage story-telling and leader networks to accelerate the adoption of new programs. Learning leaders from other global companies such as Sony Pictures Entertainment, Allegiant Travel, Stamps.com and others will also speak at the three-day Exchange. The 2017 Chief Learning Officer Exchange is an invitation-only event where top learning executives are coming together to learn how some of the world’s largest companies are using real-world data to foster diversity and inclusion, incorporate new technologies and create a culture of learning.